Along with the Proof Platinum American Eagle coin, this stunning coin is one of the two official platinum coins issued by the U.S. Government. This rare gem is one collectors and investors both seek to have as part of their collections. 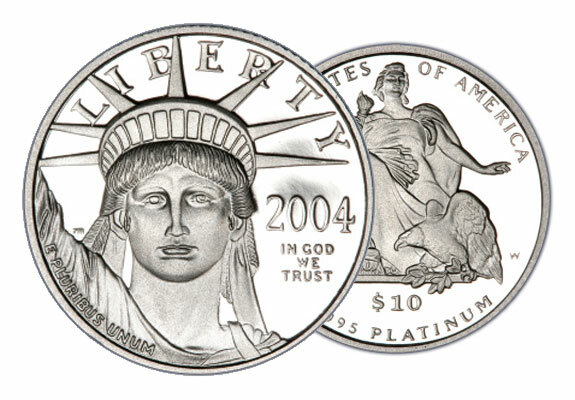 Obverse: Displays the Statue of Liberty with the year it was minted. The word “Liberty” is displayed across the top of the coin with the words “In God We Trust” appearing just below the mint date. Reverse: Displays the “Soaring Bald Eagle” by engraver Thomas D. Rogers. The coin displays the words “United States of America” along with the weight and level of fineness – .9995 platinum. There are many ways to invest in platinum such as through stocks, ETFs, and futures. The downside of these options is that you are not in physical possession of the item. If you want to be sure you are protecting your paper assets, adding platinum to your IRA can add safety, security, and diversification. Savvy investors understand the importance of diversification, and precious metals like platinum offer a level of protection outside of stocks, bonds, and real estate. For more information about adding American Platinum Eagle coins to your existing IRA, former 401(k), or precious metals IRA, or make a cash purchase for direct delivery, contact American Bullion toll free at 1-800-326-9598 to speak with a specialist.